What the blurb says: “Eddie Flynn used to be a con artist. Then he became a lawyer. Turned out the two weren’t that different. It’s been over a year since Eddie Flynn vowed never to set foot in a courtroom again. But now he doesn’t have a choice. Olek Volchek, the infamous head of the Russian mafia in New York, has strapped a bomb to Eddie’s back and kidnapped his ten-year-old daughter, Amy. Eddie only has forty-eight hours to defend Volchek in an impossible murder trial – and win – if he wants to save his daughter. 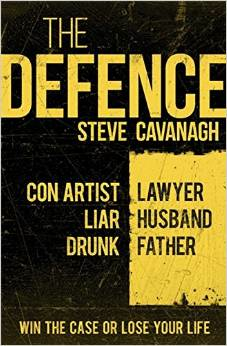 The Defence is hands down the best legal thriller I’ve read in years. Eddie Flynn – con artist turned lawyer – is haunted by the last case he took to trial. He’s turned his back on the legal profession, taken up drinking and become estranged from his wife and child. Things seem pretty bad, but as the reader discovers from the very start of The Defence, things are about to get much, much worse for Eddie Flynn. With his daughter abducted, and a bomb strapped to his own body, Eddie is forced to represent Olek Volchek – a man he has no doubt is guilty of murder. In order to buy enough time to figure a way out of the terrifying situation he’s in, Eddie has to draw on all his skills – both legal and criminal – and his friends on both sides of the law, as he gambles against increasingly higher risks in his attempt to get his daughter safe. Smart, courageous and driven by the need to protect his young daughter, Eddie makes for a compelling character – someone you can really root for. This rapid-paced, page turner of a legal thriller has bucket-loads of action and piles of sky-soaring tension. A fabulous must-read – highly recommended for all thriller fans.